Inject some colourful Middle Eastern appeal into the home with charming Paper Star Lanterns. 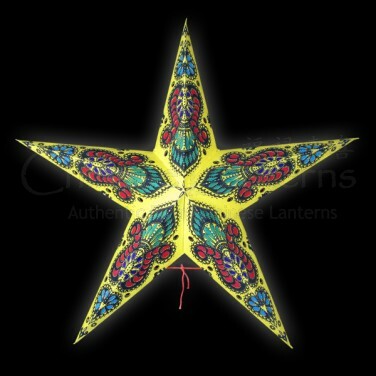 Taking inspiration from the colourful glass lanterns of Morocco and the Middle East, this yellow paper star lantern will add a burst of colour to the home. Attach around a regular light fitting with a 60w bulb, to create pretty shards of colour that stream out through the multi-coloured paper windows of the lantern. The lantern makes a stunning party decorations, or as more permanent lighting around the home.